Bleedings gums are often a symptom of poor oral hygiene; however, they can also be caused by other - more serious - health conditions. Regardless of the reason behind your condition, there are measures you can take to stop bleeding gums. Depending on the severity and causational factors, it might be possible to treat the issue naturally with herbal remedies. Many women favor this option as a first port of call, because it is possible to use ingredients you are likely to have in the home, and the solutions can be administered personally and easily. It is widely known that milk plays an important role in oral health, due to its high calcium content. Calcium is needed for strong bones and teeth, and without it the jaw bone can weaken, causing gums to become more vulnerable. Studies have shown that those who have a low intake of calcium, tend to experience more severe gum disease. For this reason, if you have experienced sensitive or bleeding gums it is recommendable to increase your calcium intake.However, milk also contains natural sugar, so be sure to brush your teeth after consuming it. 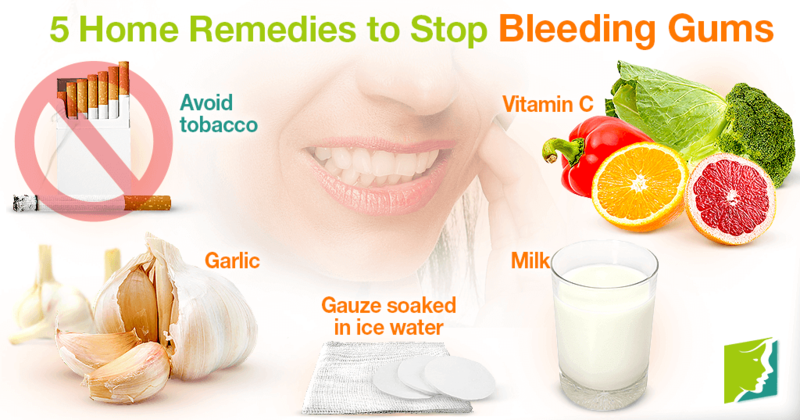 For quick relief and to stop bleeding, the application of freezing cold gauze is very effective. It can be handy to keep ice in the freezer and a bowl of cold water in the fridge, so that gauze can be cooled and prepared quickly whenever it is required. It should be applied to the affected areas with considerable pressure to stop bleeding and partially numb the area, thereby soothing any pain. Garlic is an extremely valued member of an herbalist's cabinet, particularly for its merit as an antibacterial. It contains a compound known as allicin, which boasts potent antimicrobial activity.This can be considerably effective for inhibiting the growth of fungi and bacteria - such as those that can be found to cause bleeding gums. Adding more garlic to your diet can therefore be helpful, or even better, chewing on pickled garlic cloves or supplements will allow the plant's properties quick access to the affected area. Tobacco significantly aggravates sensitive gums, and it can actually be an indirect cause of gum disease. This is because smoking leads to a lower proportion of oxygen in the bloodstream, which means it is harder for the body to fight infections. If and when the gums become infected due to the presence of bacteria in plaque, smokers are less able to fend off the infection, and the gums are unable to heal. If you are a sufferer of bleed gums, smoking is likely to worsen your situation and cause an increased infection. Many middle-aged women who suffer from this condition seek to find a cure for bleeding gums. Regardless of the reasons behind the condition, there are measures you can take to stop bleeding gums. The above natural remedies should go a long way towards relieving the health problem.